To reach Thailand's best 4x4 Auto Exporter - Sam Motors - email us now at thai4x4@gmail.com. Mazda BT-50 has been modified for year 2008: The Mazda BT-50 pick-up gets a facelift throughout the range and now with B5-compatible engine, albeit retaining the same specs. Prices up by a few thousand from outgoing version starting at B541,900 for the base RWD open-cab 144hp 2.5-litre common-rail turbo-diesel manual to B895,900 for the 4WD double-cab 156hp 3.0 five-speed auto. - What we think: As with its Ford Ranger sister, the BT-50 is best in open cab form with solid 156hp 3.0-litre engine and semi-quick shifting five-speed manual. Dated chassis with recirculating ball steering more at home off-road than on it, but H/T tyres lets it down. "BT-50 recognises the new range's B-Series Truck heritage (BT) and the number "50" reflects that this one-ton vehicle is optimally positioned between smaller payload trucks (e.g. half-ton) and much larger trucks. "The Bangkok global premiere of the new Mazda BT-50 pickup range will provide existing and prospective owners with the chance to be amongst the first to see the world's "Zoom-Zoom" Truck. We are offering a fantastic discount on this beautiful vehicle and it is moving fast especially in the Caribbean and the Southern African regions. The new Mazda BT-50 5-Speed Auto sport pickup combines the power of a high performance engine with the smoothness of a passenger car-like drive thanks to its 5-speed electronically controlled automatic transmission. Thanks to this perfect match between its Power Common Rail engine delivering a class leading torque of up to 380 Nm and its 5-speed state-of-the-art electronically controlled automatic transmission, the Mazda BT-50 5 speed auto is truly the ultimate sport pickup offering both "Zoom-Zoom" driving pleasure and convenience. It should therefore appeal to both those who use a pickup truck much like a passenger car as well as those who require tough, reliable commercial truck performance but still desire the smoothness of an elaborate transmission for a more enjoyable driving experience. On par with its advanced automatic transmission and car-like ride characteristics, the refinement of the cabin interior with its sporty design console, 6 CDs-MP3 player, double airbags and side airbags is almost enough to make you forget that the Mazda BT-50 is a pickup truck. Superior Transmission System for perfect transmission and fuel economy For the first time in Thailand a 5 -speed automatic transmission has been made available in the pickup truck segment. In line with Mazda's Zoom-Zoom concept, this bold move reflects Mazda’s commitment to bring to the public vehicle which can provide a truly exciting driving experience on every model of the range. This electronically controlled close-ratio 5 speed automatic transmission features smooth shifting and outstanding fuel economy at highway speed. 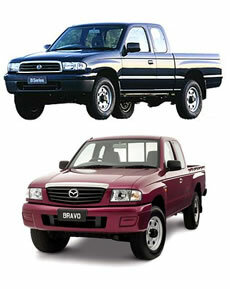 The Mazda BT-50 5 speed auto is available in a 2.5L Double Cab 2 WD version and a 3.0L. Double Cab 4 WD version equipped with the electric shift "on-the fly" system enabling transition between 2 WD mode and 4 WD mode at high driving speeds of up to 100 km/h to maximize driving pleasure and convenience..
Mazda BT-50, the new powerful pickup truck with a Double Overhead Camshaft 16-valve Power Common-Rail Direct-Injection Diesel Engine. Equipped with a Variable Geometry Turbocharger with Intercooler and 32-bit intelligent computerised system, it turns out high driving power while being economical on fuel. The Mazda BT-50 offers you good balance. It makes driving fun and yet it can handle a tough workload. With Mazda’s famous chassis system, the Active Safety System and Passive Safety System, you can be assured of precision in every turn you make. First in Thailand’s pickup industry, the BT-50 comes with side airbags for added security. The Mazda BT-50 – good for both tough work and pleasure. Mazda BT-50’s new version features a tough-looking sporty design with well-integrated exterior and interior appearance. Its appealing external curves blend with the all-new sporty interior, showcasing a high-contrast illuminated dashboard and interior trim. BT-50 – a reflection of your taste in sports vehicles. "BT-50 builds on a tradition of Mazda heritage and values," states Gough. "Its aggressive presence, command of the road and powerful new turbo diesel engines will provide leadership in this competitive truck segment." Delivering an exciting blend of sophisticated design, refinement, responsive handling and dynamic performance, owners of this exciting new vehicle will find it features outstanding versatility, comfort and convenience whether they use it much like a passenger car or in circumstances requiring tough, reliable commercial truck performance. With this new truck, Mazda has deepened its commitment to Thailand and Asia, which is an important centre of truck and automotive manufacturing for Asia and the world. Joining this new range on the Mazda stand will also be Mazda MX-5, Mazda3 and Mazda RX-8 models. The vehicle is expected in South Africa at the end of next year, and the BT-50 name will replace the current Drifter. 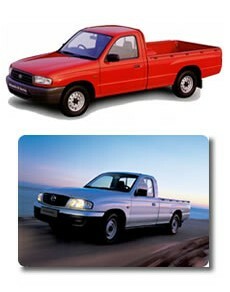 Mazda BT-50 and Ford Ranger are identical trucks made in the same factory only their external look differs. 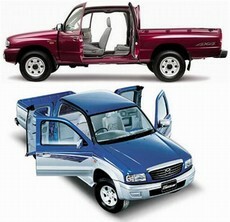 So to find out specifics of BT-50 you can check out the details of Ford Ranger 2007 on our website. Bangkok – Thailand, February 14, 2008 – Mazda Sales (Thailand) Co., Ltd. announced the achievement of the BT-50 on a 10,000 km road test using bio-diesel B2 and B5. The test, with a pit sbest at every 5,000 kilometers, had demonstrated that the engine ran smoothly, and no problem was found in the system. In addition, the engine was cleaner, emitted less carbon dioxide, and registered an impressive consumption rate of 17 – 18 km. per liter at an average speed of 110 km. per hr. This proves that the BT-50 is fully compatible with both types of fuel, thus strongly affirming Mazda’s commitment to the government's energy and environmental conservation policy. Depart Bangkok on January 21, 2008 at 12:00 am, at Mazda Bangkok headquarter, Lake Ratchada. Returning to Bangkok on February 13, 2008 at 12:00 at Mazda City, Rama 4 Road. 1. Engine test and engine oil check: Engine running normal, no unusual noise. 2. Lab tests of oil samples to seek any residue: No contamination found. 3. Torque Test: Torque rate is normal. 4. Emission Test: The engine is clean, with less emission. 5. Fuel consumption test & record: Average consumption rate is 17 – 18 km. per liter. 6. Hoist vehicles to conduct overall check such as oil filter parts, engine oil, piston rings etc: From overall check, all parts are in normal state. While the Mazda BT-50 with a 2500cc engine was filled up with bio-diesel B2, the other BT-50 3000cc engine utilized bio-diesel B5. This road test was conducted in 2 parts by famous actor-turned-racer Pete Tongchua and his team. The testing team first took route 1, leaving Bangkok for the South of Thailand, then heading North, Northeast and East prior to returning to Bangkok, covering a total distance of over 7,000 kilometers. The second route, spanning a 3,000 kilometer distance, started at Bangkok heading south to Phuket, then turning north to Chiang Mai, Chiang Rai and back to Bangkok. A pit sbest at every 5,000 kilometers was taken in both routes to check the engines for evaluation. The final test results turned out highly satisfactory. 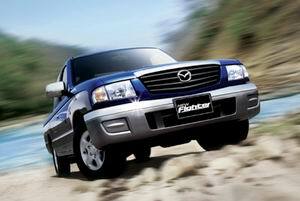 No other commercial vehicle in the world can provide you the fun and satisfaction that the Mazda Fighter can. Better than your wildest expectations the Mazda Fighter is the ultimate class leader. Mazda recently revamped the B2500 Fighter 4WD truck. And many steps have been taken to bring about a fresh new look. Exterior-wise, there is now a two-tone colour scheme and the roll-bar at the rear is now colour-coded for a harmonious effect. The effect is completed by distinctive 16-inch alloy wheels that are shod with Sime Alpina tyres. The familiar 2.5-litre intercooled trubodiesel with indirect fuel injection has been improved: a 12-valve single camshaft unit that delivers more power at 121 bhp at 3500rpm (from 117bhp) and 262 Nm of torque at 2000rpm. The Fighter continues to have a five-speed manual transmission. The suspension is basically similar to the previous model with an independent double wishbone front supported by torsion bar and tubular double acting shock absorbers. The rear is served by rigid leafsprings with double acting shock absorbers. Its is in the tuning of the suspension that separates it from the old. Significant changes include an anti-lock brake system (BS) for the standard front discs rear drums brake arrangement, dual airbags for front occupants, stronger side impact beams in the doors and limited slip differential. On the road, the ride comfort is impressive. Rear passengers are not tossed about like basketball over bumps and there is no noticeable pitching on the highway due to irregular road surfaces. Torque is adequate, enough pull to give you that quick charge for a turbo diesel which is more than adequate to flow in with the highway traffic. Intrusion of engine noise is also kept to a minimum and you can cruise along on the highway and enjoy the music without increasing the music volume. The new Mazda Fighter is as attractively priced as before but with a better package in engineering and fittings than before. Another attraction is the new range of colours to add fresh sparkle to its novelty. Mazda Fighter is available in three distinct body styles — Single Cab, RAP Cab and Double Cab — and with a choice of two- or four-wheel drive the B-Series is powered by a 2.5-litre diesel engine. In the case of the 4x2 Single Cab it is normally aspirated, produces 84 bhp (4,000rpm) and develops peak torque of 144 lb/ft at 2,000rpm. All other models get the turbocharged version of the same powerplant which raises the figures to 109 bhp (3,500rpm) and 197 lb/ft at 2,000rpm. Suspension is independent at the front with double wishbones and torsion bar while the rear features a solid axle and semi-elliptical leaf springs. Brakes are ventilated discs at the front and drums at the rear. ABS is fitted on all models bar the Single Cabs, but power steering is standard across the range. All B-Series pick-ups come fitted with passenger and driver airbags as standard, and all the 4x4 models have a rear limited-slip differential to aid traction. The Single and Double Cabs are self explanatory, but the RAP or stretch Cab is unique to the Mazda (and the Ranger, of course). It offers storage space behind the front seats as well as a couple of foldaway, forward-facing 'jump' seats. Not great for long distances, but sufficient for local trips to a job. This rear compartment is accessed via rear-hinged, half-sized doors and the really clever bit is that there is no need for a B-pillar, just like on the RX8 sports car. The exterior has a more refined and dynamic looking shape, newly designed headlights, larger windscreens, new front grille, semi-concealed wipers and moulded mud flaps. 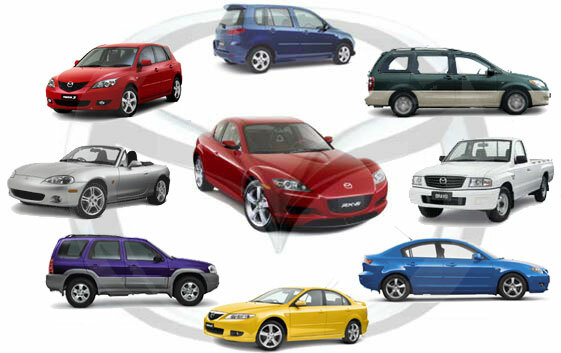 There is a greater choice of body colours to choose from, all of which have undergone Mazda’s new paint process, which ensures a superior finish and greater resistance to corrosion. The stretch cab is aimed more at the user who needs the flexibility of an open loading area and extra passenger carrying room in the cab. Ideal for transporting crews or giving a secure covered storage area for work tools etc. The double cab offers users the option of more space for carrying passengers and still gives the flexibility of the open cargo area at the rear. This version has a second set of doors that open into the rear seats of the cab. All cabs have a bright and airy feel with excellent all-round visibility, thanks to a large windscreen. The interior has class leading room and comfort for the driver and passenger alike. Legroom, headroom and shoulder-room have all been improved as a result of increasing the width of the cab and its overall height. To make it easier to enter and exit the vehicle, in addition to reducing driver fatigue, the seats have been positioned higher and have a higher hippoint. It also has many car-like features and equipment, including tilt adjustable steering wheel, powersteering, electric driver’s window and a low-fuel warning lamp. Other conveniences are day/night rear view mirror, intermittent wiper function, digital clock, climate control and rear window demister. Fighter - Super Saloon Extra Cab The cabin of the Mazda Fighter Super Saloon provides that extra space and comfort over the standard cab version, making comfortable for numerous occupants. The super Saloon is available in 4x2 and 4x4 variants, providing great flexibility depending on your needs and requirements from the vehicle. Fighter - Offroad 4x4 No matter what the road conditions the Mazda 4x4 fighter can take it. The power and traction provides the ultimate rugged utility vehicle for those rough and uncharted areas. 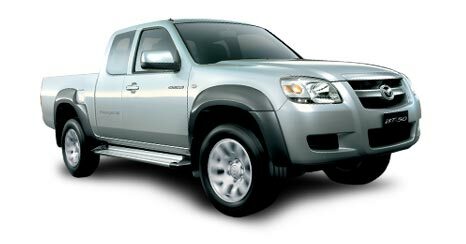 Fighter - Double Cab The Mazda Double Cab pick up with 4 doors is available in either the 4x2 or 4x4 variant. This provides comfortable, go anywhere vehicle with power to spare. RFW (Remote Free Wheel) System allows you to easily switch from 4x4 to 4x2. LSD system minimizes wheel spinning while driving off-road so you can master gravel, dirt or mud without missing a beat. Both passive and active safety features allows you to travel safely.